Royal mail 1st class UK deliveries: If your order is made before 1pm GMT Monday – Friday we will endeavour to deliver your order to the post office the same or following day. If after these hours please allow 3-5 working days before contacting us. It should be noted that the guarantee to deliver your package by the next day is made by Royal Mail and not us. Therefore Emerald Heritage cannot accept responsibility for the late arrival of your order. Delays outside of Royal Mail’s control that are not covered include weather, acts of God, strikes. Please note: Next day delivery means it is shipped the following day from your order, unless it is a Friday afternoon, Saturday or Sunday. Prices are shown for a 1 sq ft plot, postage is charged according to weight of the total order, actual costs are shown on the checkout page. Will You Plant A Tree On My Plot Land? We can never guarantee that the trees will be planted on your specific plot. The reason for this is that we are working with a a strategic partner to plant native Irish trees on the whole site. We want to create a native woodland which will connect two pieces of ancient woodland on each side of the site. This will improve the amount if available habitat for native creatures, like the rare Red Squirrel. What Does It Mean If I Receive An Email Saying That Payment Is Pending? If you receive an email stating payment is pending this may be because we haven’t (for whatever reason) received payment from your account. If I Am A Squire Will Me Spouse Be A Squire Or A Squiress? Your title is simply a descriptive title as a landowner of an Irish estate. Therefore should you wish any member of your family or friends to apply the same title they would also need to own their own little piece of the Emerald Isle. By purchasing one of our joints packs you can also ensure that your plots are side by side. How Soon After I Purchase My Plot Will I Receive My Official Documents Of Ownership? Once we receive your payment we will send you confirmation by email and again when it is processed for delivery with your documents included. You can print your documents prior to the official pack arriving in the post. We will despatch your documents within 24 hours (Monday-Friday) of your order being placed. Delivery usually takes from 5 to 7 working days but international purchases may take longer. Please note: Royal Mail will deliver your pack. Emerald Heritage have no control over Royal Mail’s delivery service. Is A Frame Included For My Certificate As Shown On Your Website? No. This is just to demonstrate to you how it would look in a frame. Can I Order A 'Gift Wrap' Service? Yes, you can order the gift wrap service during the payment process. This includes natural paper which is hand wrapped along with an emerald green ribbon and sealed with the Emerald Heritage official gold embossed seal. How Do I Purchase A Joint Pack - What Is It? A joint pack it is basically the same as purchasing two single packs and will include exactly the same information. The difference is that the documents come in a single folder. You will also be able to pay for one registration rather than two. You will receive two plots of land beside each other with the full legal documentation of ownership. Can My Plot Be Owned By Two People? No, it’s strictly 1 plot/1 person. Should you wish to purchase for two people, you can purchase our joint pack or two single purchase packs, which means they will be both be side by side. Can I Buy More Than One Plot? Will They Be Beside Each Other? Yes you can. You can purchase as many as you wish. If you purchase more than one plot at the same time they will be located beside each other. This cannot be guaranteed if you purchase your plots on other dates. Will I Be Able To Go And Look At My Land? We’d be delighted if you did! You are the legal owner after all. In your purchase pack (delivered along with your certificate) there will be a map, reference, and instructions to find your own patch of Ireland. Can I Set A Particular Date On The Documents? Yes of course. We can put any date you wish on the documents, perhaps a birth date or anniversary. This will not delay the delivery. You cannot request a year prior to 2014 when the land was purchased. In the unlikely event that you are not happy with your package and as long as the documentation is returned in full, once received, we will ensure a refund (excluding postage and a £5.00 administrative charge as we cannot reuse the packs). See our terms and conditions. Please Note: As these are personalised documents we are not obliged to offer a refund. We cannot offer a refund once the land has been registered with the Land Registry. What Should I Do If I Get Married Or Decide To Change My Name? Your documents can be reissued to you with your change of details. Do You Have To Be A Certain Age To Purchase The Plot? No. This is simply because the land is transferred by Deed. Some of our customers have bought the land for babies even before they are born. It makes for a wonderful Christening gift. Can I Buy The Land/Plot as an Irish gift For Someone Else? Yes! It makes a great personal gift for any special occasion: birthdays, anniversaries, Christmas or of course St Patrick’s Day. All you have to do is enter the name of the person you would like to buy the land for and where you want to have it delivered. We have made this easy to follow during the purchasing process on our website. As an added bonus you can even add a personal message of your choice at no extra charge. Can I Buy The Land Even If I Am Not an Irish Citizen? Yes. The land can be purchased irrespective of nationality. Our customers reside all over the world. However, it should be noted that owning land will not assist you with obtaining a visa or any residency rights but this does not stop you coming to visit your land. Can I Choose The Size Of My Plot? Yes you can. We will give you the option to purchase 1 sq ft or a 1 sq ft joint plot during the payment process. You can purchase as many as you wish. If you purchase more than one plot at the same time they will be located beside each other. This cannot be guaranteed if you purchase your plots on other dates. Can I Request That My Land Is Given As An Inheritance? Of course! You own it after all. You can either sell the land on to someone else or leave it in your will. However, you will need to request a re-issue of documents on our website. How Can I Legally Buy This Wee Plot Of Irish Land? Unlike other jurisdictions Northern Ireland still permits the sale of ‘souvenir plots of land’ under Contract Law. These wee plots of Irish land can be sold without the requirement of the same registration if you bought a house or small area of land in The Republic of Ireland, UK, Europe or any other international jurisdiction. Emerald Heritage is the first and only Irish conservation project of its kind and we are proud to be working with the Registry and many other local and regional organisations on this project. This plot of FREEHOLD Irish land is yours in perpetuity to pass down through your family generation after generation. Within your pack is Certificate of Sale to confirm that ownership has been transferred to you. We are always happy for you to contact us if you have any further queries. Can I Decide NOT To Register My Plot During The Payment Process? Then: pay your Registration fee. The Registration is a one off fee that never has to be paid again. We can assure that you will never have any taxes or any other fees to pay regarding your land, regardless of what country you reside in. This is such a small plot that it’s characterised as a “souvenir plot”. A souvenir plot is defined in the Land Registration (Northern Ireland) Act 1970 as “a piece of land which, being of inconsiderable size or no practical utility, is unlikely to be wanted in isolation except for the sake of mere ownership or for sentimental reasons or commemorative purposes”. Unfortunately we can no longer accept cheque payments due to the increasing bank charges related to lodging international cheques. Furthermore the ever-changing conversion rate means that Emerald Heritage were essentially bearing these costs. What Happened To Ireland's Trees? and other Irish native species dominated our landscapes and Ireland was very much a forest culture. The arrival of the Stone Age farmers (around 3000 years ago) was when clearance first started and by the 15th century only 14% of native woodland remained. Sadly by the 1801 this island was completely deforested and only a fraction of the original landscape has returned. We are still the least wooded country in Europe, with merely 1% of our native woodland left. While Irish native woodlands are a valuable part of our past, it is vital they are preserved as part of our future. A native tree is one that has not been introduced by man and occurs naturally. Native trees are perfect for providing food and shelter for our wildlife, manufacturing oxygen for both animals and humans. Should you wish to plant your own tree, please ensure that it is native Irish species. What Happens To My Title And Land After My Death? You can leave your title along with your plot of land in your Will upon your death and to who ever you wish to leave it to. As the owner you will also have the option to sell your land to someone else. To do this simply order a re-issue of documents on this website. A Master Title Deed is very similar to how a Deed Poll Operates. A person has the right to adopt a title that they have the authority to use and this document confirms one’s intention to do so. By your ownership of a small Irish estate you gain the right to use the title. Included in your pack is a Master Title allowing you the option to change your title should you decide? It will be suffice for banks, credit card companies, utility bills and such. How Can I Use My Title? As an Irish Landowner you can refer to yourself as a Squireen. An Irish ‘Squireen’ means Irish Landowner and translated into English means (male form) ‘Squire’ or (female form) ‘Squiress’. It is simply a courtesy title, not a nobility title and this should not be confused as such. You can use your title on your bank details, utility bills and many other forms of identification as long as it is not used illegally for actions such as fraud or money laundering etc. We have included your personalised Master Title Deed which is accepted internationally to confirm your change of title on your chosen official documentation. However, it should be noted that some government documentation i.e., passports or driving licenses do not require a title and therefore cannot be changed. How Do I Know That My Payments To Emerald Heritage Are Secure? We receive all debit and credit card payments via Stripe. We do not store or receive any of your debit or credit card details and this is all carried out securely through Stripe. Your details cannot be accessed by any third parties and Sage Pay delivers one of the most secure payment platforms in the world with over 4 billion payments securely online every year for over 50,000 businesses of all sizes. You will see from the padlock that is visible to your address or status bar on the payment page that your credit or debit card payments are entered onto a secure site. Emerald Heritage uses Stripe to ensure that your card details are not compromised.Stripe’s secure systems are scanned and audited by one of the world’s leading Qualified Security Assessors (QSA) so that you can be assured that you are confidently making a secure payment online. Stripe also automatically provide all their customers with fraud prevention tools – in other words if your card has been compromised somewhere else, our e-tailers are using technology that will prevent your details being illegally used on their own site. Should something strange or unexpected happen whilst you are on our site, please Contact Us immediately with as much information as you can. Will My Details Ever Be Passed On? We will NEVER pass your details on to other companies. You can rest assured that any emails you receive will be only from us and not from other companies. Perhaps you could add Emerald Heritage to your Friend’s list so that any email correspondence does not go to junk mail. If you ordered the land for someone else please pass on any emails we send you regarding the land. Are There Any Further Costs That I Should Know About? No. The total cost is the amount you paid initially to purchase your plot. You now own this land. However, should you wish to register your little plot with the Land Registry at an additional cost then simply click ‘Yes’ or ‘No’ during payment process and we will do this on your behalf. We register these plots on an end of month basis. Once it has been registered with the Land Registry we will receive your unique registration code. The process to register your plot takes about four to six weeks, from the time we send information to the Land Registry, to the time we receive it back. Simply go to Access my Information to view your code. Can I Camp On My Land? 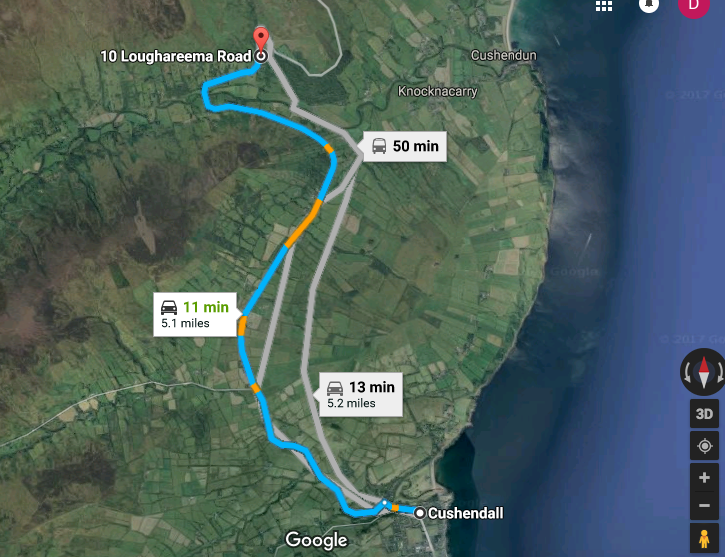 Sadly due to the situation of the site close to the main Coast Road, through the Glens of Antrim it would not be safe to allow access for camping. Also, when the site is planted in trees, there will be no space to pitch your tent, as it will be growing into a new native wood!. Can I Use It As A Graveyard? You are welcome to scatter ashes on the land but it cannot be used as a burial plot. Do You Allow Ashes To Be Scattered On The Land? Yes – many people are interested in scattering their loved one’s ashes there. Woods are nature’s cathedrals – they have a distinctive peaceful and spiritual feel, making them natural resting places. We understand the desire to link your loved one with a such a special place forever, so if you wish to scatter their ashes, please feel free to do so. Access to the site, along the main Coast Road, does not lend itself to parking traffic. Make sure your park off the road access the site on foot. Exercise common sense and care at all times. However, for the sake of our woods and visitors please follow the guidelines below to ensure that the land is kept as natural as possible for everyone to enjoy: Please be discreet. You can leave a very small biodegradable marker, ie small stone. Please do not leave silk flowers, casket, paper or plastic wrapping. plant anything such as flowers, shrubs or bulbs. Do I Need Anything Else To Register My Land? Emerald Heritage’s legal team has worked extremely hard to ensure that we have complied with every legal detail. Your pack arrives with the official legal deed and documentation of ownership, stating that you are the legal owner of the specific plot. We have developed a unique system whereby plots purchased via our website can be officially registered. In order to legally transfer the plot to you under Contract Law we need to be able to define its location precisely. We do this by using Ireland’s Ordnance Survey reference system. The location of each plot is unique. We also provide you with an estimate of the latitude and longitude of your plot. How Can I Locate My Plot? Once the plot of land has been legally transferred to you, and in compliance with Contract Law, we ensure that you can define its unique location precisely with an estimate of the latitude and longitude. 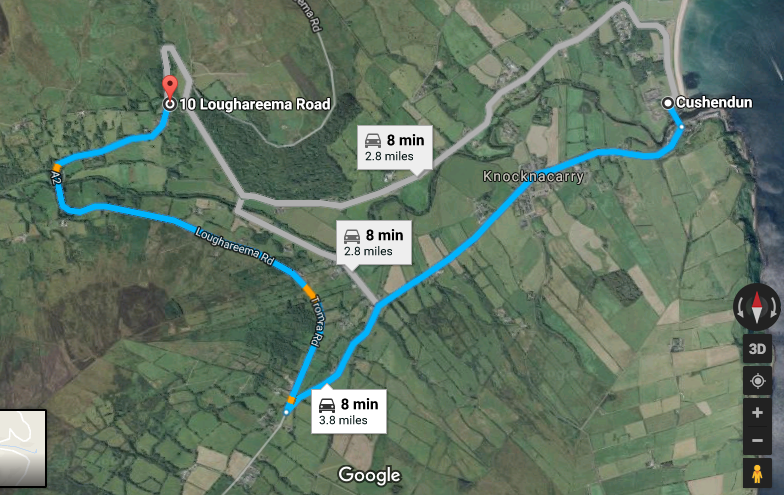 We also provide you with the exact location using Ireland’s Ordnance Survey reference system. 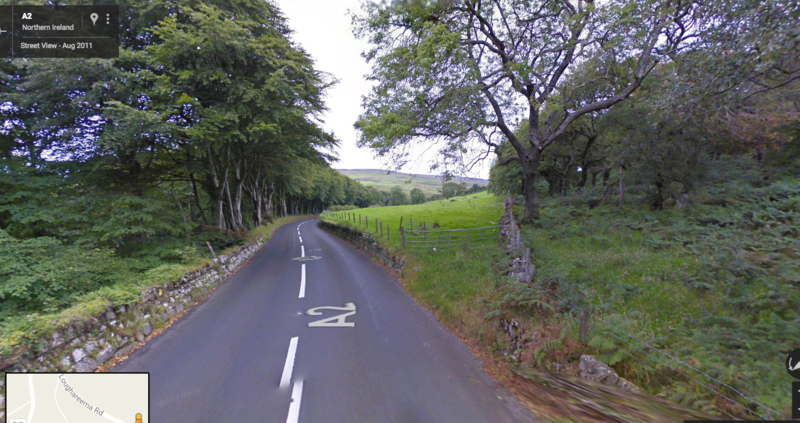 Your land is in Glens Wood (an extension of Cregagh Wood) located within the famous ‘Nine Glens of Antrim’. The landscape has been officially designated ‘An Area of Outstanding Natural Beauty’ (ANOB) and has been ranked number five in the world and number one in Europe for its spectacular scenery and magical views. 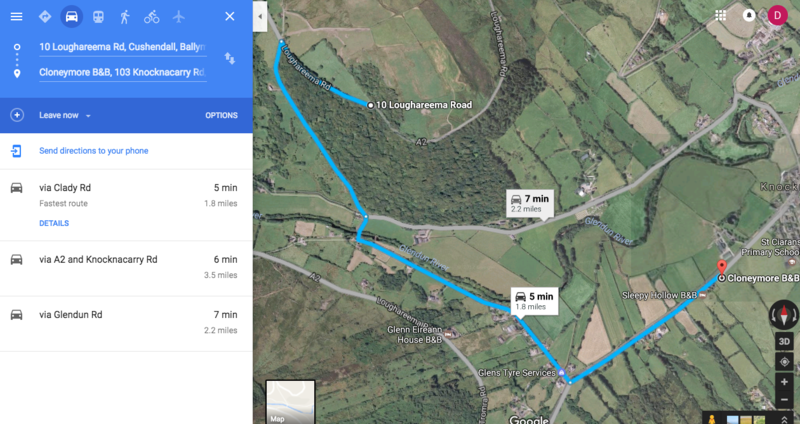 Use the A2 road – known locally as the “Coast Road”, “Causeway Coastal Route” or “Loughareema Road"
We highly recommend checking out the Loughareema (Vanishing) Lake nearby as well. 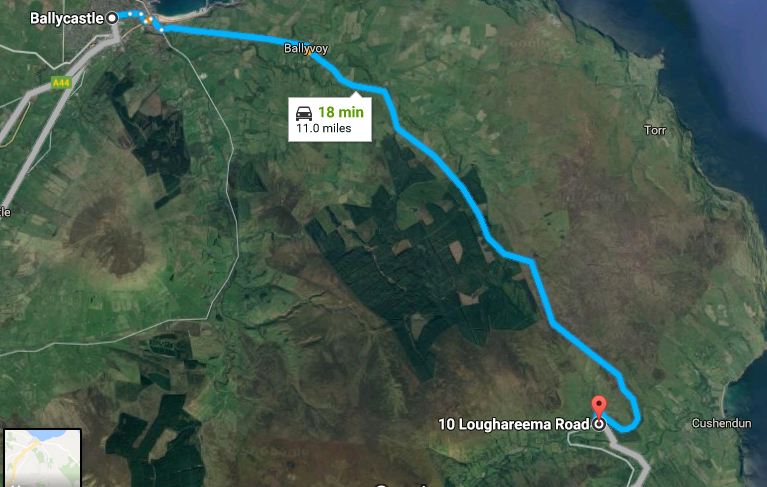 I’d recommend getting a coffee at Ursa Minor in Ballycastle and checking out Murlough Bay also in Ballycastle. Well, it’s really up to you, with a few provisos. You can come and visit the area and take a walk around the land. Feel free to photograph the land and we would be delighted if you email your pics to us so we can post them on our website. You are also welcome to scatter ashes. How Can I Find My Land? We have made your plot easy to find. Along with all the legal documentation (put together by our solicitor) is a beautiful presented map with your unique plot number and Ireland Ordnance Survey co-ordinates. You can convert these to GPS co-ordinates by clicking on this website and then entering your unique plot number. Note: Exercise caution and common sense when accessing the site, please park your car in a suitable off road site and walk, with caution to the site along the edge of the road ( which can be busy at times). Of course you can. You do own it after all! Will I Really Own The Land? Yes you will. Under Contract Law we must provide you with the precise location of your purchased plot by using Ireland’s Ordnance Survey. We will provide you with the exact location (which will be written on your certificate) to confirm you that you are legally the owner of that particular part of the glorious north coast of Ireland. If you log in to your account on this website and type in your unique plot number it will direct you to your land via Google Maps. Some of our Squireens had difficulty converting the Ireland’s Ordnance Survey co-ordinates to GPS as this can be a complicated mathematical process, so have done the hard work for you! Once on Google Maps you will also be provided with the GPS co-ordinates should you decide to visit your land.